Postcode SA71 4JS for those with Sat Nav. Park in Pembroke Main Street - Watch out for the Traffic Warden! Enter via the front entrance opposite Somerfields Supermarket. Walk towards the rear of the building and you will see the hall in which we practice. Please sign in on the register as you enter, we try to start on time, to give you the full hour. The toilets are in the main entrance on your right. Better still, go round the back where there is Free Parking for users of the Town Hall. Drive through the Main Street (one way only ) to the mini roundabout, take the third exit and follow the road down Well Hill. Keep following this road along the Commons past Pembroke Carvery Chinese Resturant, until you can turn right (get in lane) as if to go up the hill past Pembroke Castle. As soon as you turn up the hill, indicate right and follow the sign for "The Old Kings Arms Hotel". You are now on "The Parade". This is a narrow, one way street with speed bumps. You will now be passing the rear of all the Main Street properties. Go past St.Oswalds Doctors Surgery, keep your speed low. As soon as you see the sign for "The Old Kings Arms Hotel", turn left behind the wall that the sign is on. This is the entrance to the Town Hall car park. 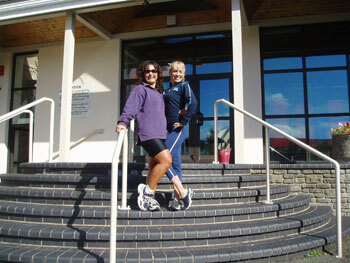 Come on up the steps and enjoy your Pilates. Please sign in on the register as you enter. We try to start on time, to give you the full hour. If you need the loo and the hall is in use, you can access the toilets via the side door, which takes you down the side of the building to the front entrance. Postcode SA72 4TT for those with Sat Nav. Take the A477 out of Pembroke Dock for just over 2km towards Carmarthen, then turn left where signposted to Cosheston. Follow this road, crossing straight over the cross road for another 400m approx, until you see what looks like a wishing well on the left. Turn left here into the free car park. Either take the A4075 out to the Fingerpost, turn left on the A477 back towards Pembroke Dock. Then take the Cosheston turning on your right and follow instructions above. At "The Green" in Pembroke, turn opposite the Texaco garage to go up Golden Hill Rd, down the other side on Mylett's Hill to cross the A477 turning right, followed by immediate left turning towards Cosheston. Then follow the instructions above. If your class is the first of day, please enter via front door and sign in. If you are in the second class, please wait either in your car, or in the entrance until the previous class is finished. We try to start on time, to give you the full hour. 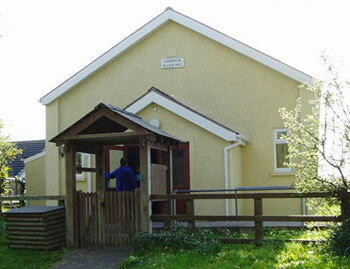 We are based in a lovely ex work house within the Allensbank Holiday complex, just South of Narberth on the A478.